Yesterday morning Mark and I dragged ourselves out of bed and into the car at 5 a.m. to begin a 15 hour drive north to Canada to visit friends on Saturna Island before running classes on Vancouver Island this coming weekend. 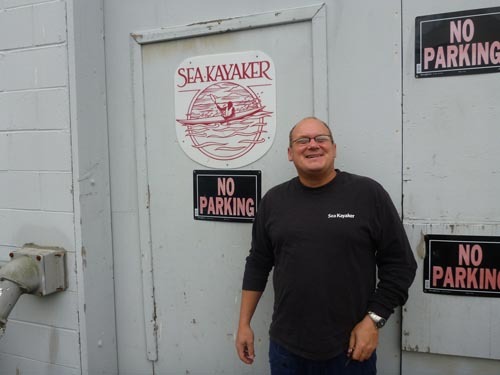 On the way we stopped in Seattle, where we were warmly greeted by Paul Riek, Advertising and Promotions Manager of Sea Kayaker Magazine. We had a wonderful time catching up with not only him, but also publishers Joan and Michael Collins, sea kayakers Bob Burnett and Christine Burris, as well as Doug Helton, Incident Operations Coordinator for NOAA. Later that evening we made our way to editor, Chris Cunningham’s house to catch up with him before getting a great night of sleep after a long day of travel. Going to work with Chris. Paul hanging out at his desk. The following morning we headed to Sea Kayaker Magazine to watch the magic happen. Mark and I work at a small, weekly newspaper during the winter, so we are aware of how much work goes into producing a publication. We were quite impressed that the popular magazine is put together by a staff of four full timers, and two part timers. Everyone was smiling and chatting as they worked diligently on putting together the next high quality edition of the magazine. 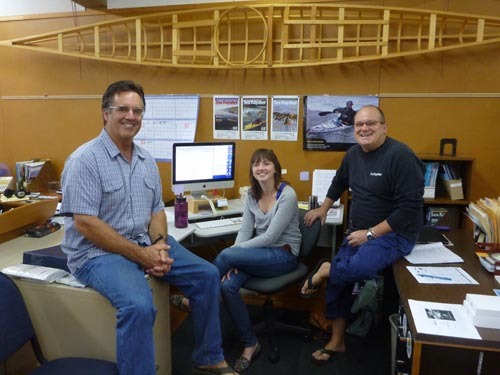 Chris and Paul with Editorial Assistant, Kat Wertzler. 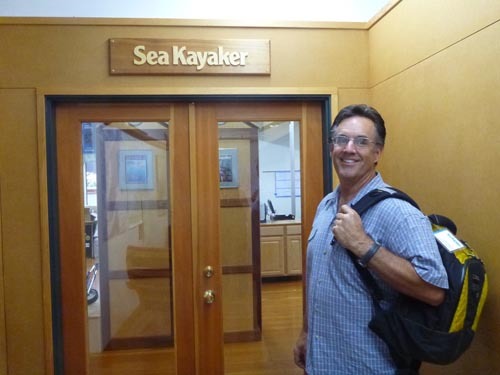 The large, one room office overlooks the Puget Sound and is decorated with charts, kayak frames and other intriguing objects that would catch any kayaker’s eye. 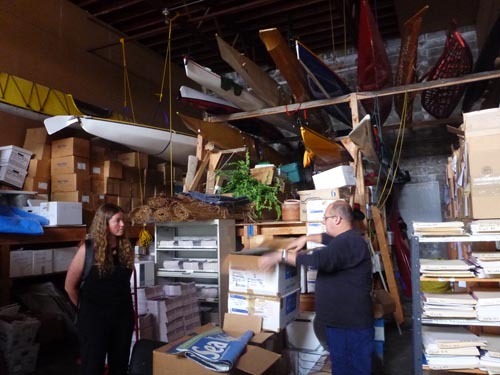 We had a wonderful time talking with the staff and then visiting the storage facility across the street that houses back issues of the publication, merchandise and of course, kayaks. After a tasty breakfast and a short walk on the beach with Paul, we hopped back in the car to head up to the border, with crisp new Sea Kayaker hats on our heads. 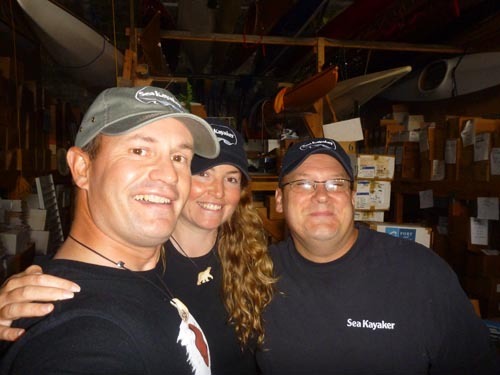 Paul hooks us up with Sea Kayaker apparel. Thanks Sea Kayaker for making us feel so welcome! I should have told you to tell Chris his editorials are the highlight of the magazine for me. Glad the car made it and say “Hi” to the folks on Saturna for me. Your hair looks great! You haven’t been paddling for a while. 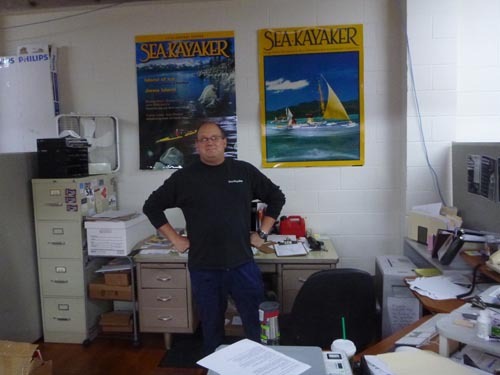 Nice post, I’m subscriber of Sea Kayaker Magazine too and is good to know how the magazine borns. Thanks for sharing!